The spicy root is actually an underground rhizome of small herb plant belonging to the Zingiberaceae family, of the genus: Zingiber. Ginger herb.Fresh ginger root. Note for the knobby surface. 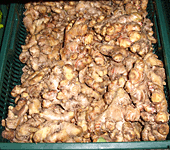 Ginger is thought to have originated in the Himalayan foothills of Northern India. Today, it is widely grown all over the world as a major commercial spice crop. The ginger plant grows to about a meter in height and features thin grass-blades like dark-green leaves and small yellow flowers. Its root features knotty finger-like projections that grow downward from the soil surface. Fresh root has a silver gray outer skin (peel). Cut sections feature creamy white, yellow, or red-colored crunchy flesh depending upon the variety. The root often contains thin strands of fibrils running lengthwise through its center, especially in overmature ones. Ginger has a pungent, spicy and aromatic smell that comes from essential oils and phenolic compounds such as gingerols and shogaols in the root. Ginger root has been in use since ancient times for its anti-inflammatory, carminative, anti-flatulent, and anti-microbial properties. Total antioxidant strength measured in terms of oxygen radical absorbance capacity (ORAC) of ginger root is 14,840 µmol TE/100 g.
It contains health benefiting essential oils such as gingerol, zingerone, shogaol, farnesene, and small amounts of ß-phelladrene, cineol, and citral. Gingerolshelp improve the intestinal motility and have been anti-inflammatory, painkiller (analgesic), nerve soothing, antipyretic as well as anti-bacterial properties. Studies have shown that it may decrease nausea induced by motion sickness or pregnancy and may help relieve a migraine headache. 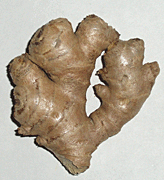 Studies suggest that zingerone, a chemical compound which gives pungent character to the ginger root, is effective against E.coliinduced diarrhea, especially in children. This herb root only has 80 calories per 100 g and contains no cholesterol. Nonetheless, it composes many essential nutrients and vitamins such as pyridoxine (vitamin B-6), pantothenic acid (vitamin B-5) that required for optimum health. Furthermore, it also holds a good amount of minerals like potassium, manganese, copper, and magnesium. Potassium is an important component of cell and body fluids that helps controlling heart rate and blood pressure. Ginger root slices, boiled in water with lemon or orange juice, and honey, is a popular herbal drink in Ayurvedic medicine to relieve common cold, cough, and sore throat. Its extraction is used as a vehicle to mask bitterness and aftertaste in traditional Ayurvedic preparations. Gingerols increase the motility of the gastrointestinal tract and have analgesic, sedative, anti-inflammatory, and antibacterial properties. Studies have shown that it may help reduce nausea caused by motion sickness or pregnancy and may help relieve a migraine.